Chris Wedes played J.P. Patches on WTCN in the late 1950’s before taking the character to Seattle where he was on the air for over 20 years. In 2006, J.P Patches and Stan Boreson, another Seattle kids show host presented this 90 minute holiday retrospective featuring episodes of their shows. The first part is a J.P Patches episode called “How Santa Got His Elves… more or less.” The second segment is a 1980 Stan Boreson holiday show with many vintage film performances. 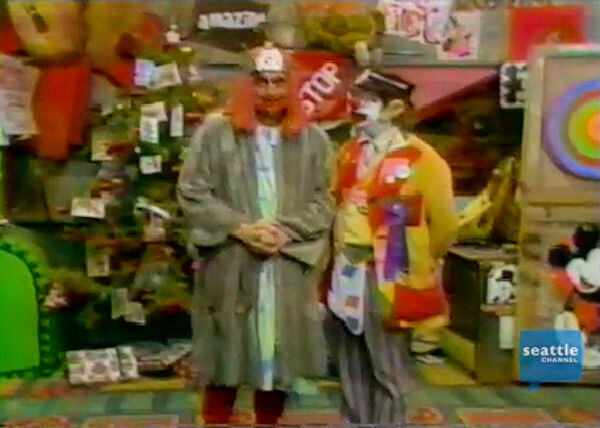 The final segment is another half hour J.P. Patches show where J.P. becomes Super Clown to save Christmas from Boris S. Wart. These programs are a bit removed from the time of J.P. Patches in the Minneapolis, but it is still a rare look at a Twin Cities kids show legend.